Celebrate the coming of fall fashion at one of Vancouver’s biggest events – FASHION ON WEST 4th. Kitsilano is celebrating the arrival of sweater weather as the official neighbourhood of Vancouver Fashion Week, from Thursday, September 14 to Sunday, September 17. You’ll get to go along to the four-day event and see fall fashions showcased at more than 20 locations, attend pop-up parties, fashion shows, and hear live DJs spinning. Oh, there will also be discounts at select stores, incentives, and give-aways including the coveted West 4th Avenue canvas tote-bag. Each year the official tote is packed full of goodies from the merchants of West 4th Avenue – including Vancouver Fashion Week tickets. “Fall is a season to get cozy and this fall sweaters are big, long and uber cozy. Lots of luxe fabrics like velvet along with the 18th century flounces and ruffles are big this fall,” says Coco’s Closet owner Donna Hohl whom is hosting a fashion-show in-store on Thursday evening. Retail Manager at The Latest Scoop, Kendra Weiss, is “loving the chunky knits paired with cropped frayed denim and leather slides to perfect the fall look.” You can check out these styles for yourself by attending The Latest Scoop’s Fall Fashion Party on Friday evening. 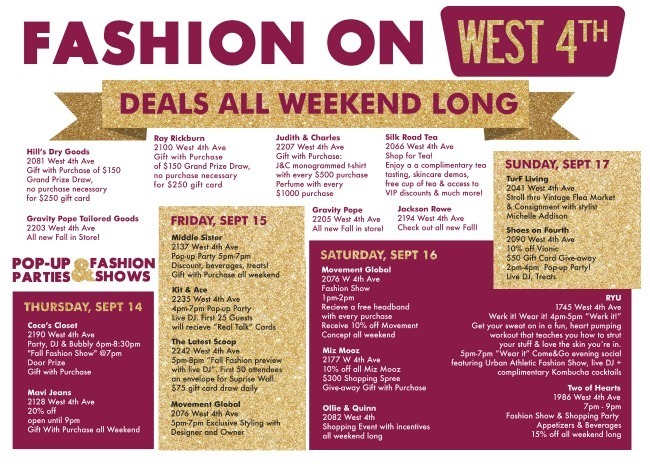 To make sure you don’t miss out on any of the fall fashion festivities, visit shopwest4th.com for perks, dates, and a full schedule of events. “West 4th Avenue has such an incredible selection of retailers that invest in being on trend and stocking what is fresh for the season. What better way to showcase their expertise than to celebrate the fall fashion season,” says executive director of the Kitsilano West 4th Avenue Business Association. West 4th Avenue retailers including; Hill’s Dry Goods, Ray Rickburn ,Gravity Pope, Gravity Pope Tailored Goods, Judith & Charles, Jackson Rowe, and Silk Road Tea, will have deals live throughout the whole weekend so you might just want to pop in store to have a browse.